Normally, HTML elements follows by the rules describe what kind of content. These rules are combined into content models. Generally, HTML elements belongs to zero, one or multiple content models. Familiar content models distributed by many elements. Metadata content category changes the appearance or behavior of the html document. It’s having links to other documents, or convey other out of band information. 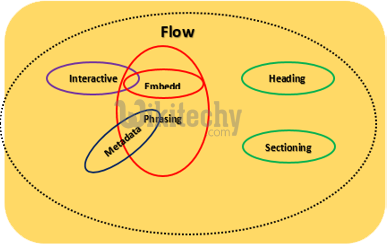 The flow content category elements which contain text or embedded content. Sectioning content category defines a part of the present outline that defines the scope of <header> elements, <footer> elements, and heading content. Some of the sectioning content category tags are <article>, <aside>, <nav> and <section>. Heading content category specifies the title of a section, whether marked by an outside sectioning content element or inside defined by the heading content itself. Phrasing content category specifies the text of the html document and mark-up which contains. Runs of phrasing content create paragraphs. Embedded content imports different resource or includes the content from different mark-up language or namespace in the document. Some of the embedded content category tags are	<audio>,<canvas>, <embed>, <iframe>, <img>, <math>, <object>, <svg>, <video>. Interactive content category adds elements which are specially described for user interaction. A content is palpable when it's neither blank nor hidden. Whose model is flow or phrasing content, which have at least one node which is palpable. Form-associated content contains elements which have a form owner, defined by a form attribute. Contents must be defined properly. It should be valid in HTML 5. If transparent element were eliminated and recovered by child element. Content models familiar to structure-related elements. Unusual categories distributed only by a few elements, frequently only in an exact context.